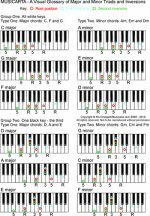 Beat and rhythm are as important to the modern keyboard player as to any other popular music instrumentalist, but in conventional piano teaching, the development of natural rhythm skills is usually left entirely to chance. 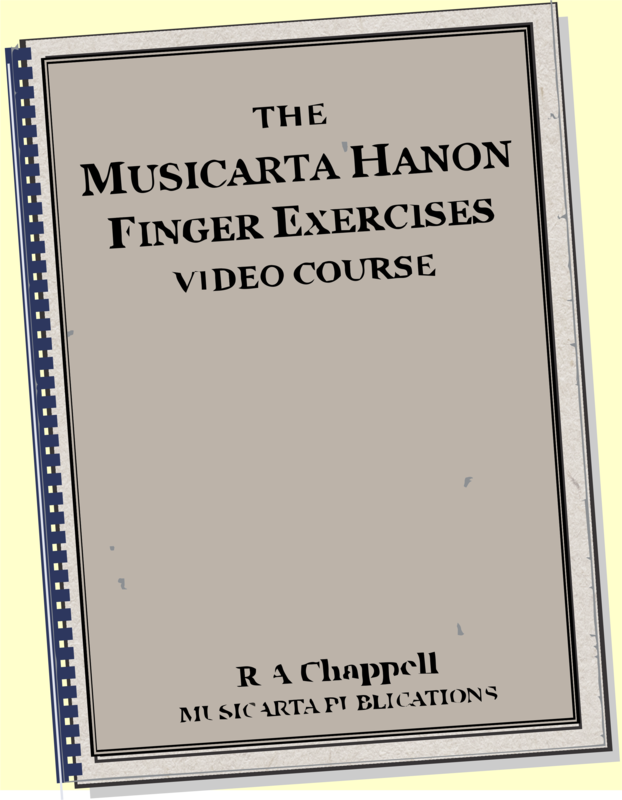 The progressive tapping exercises in this Musicarta module offer a way of approaching systematically the education of rhythmic skills. 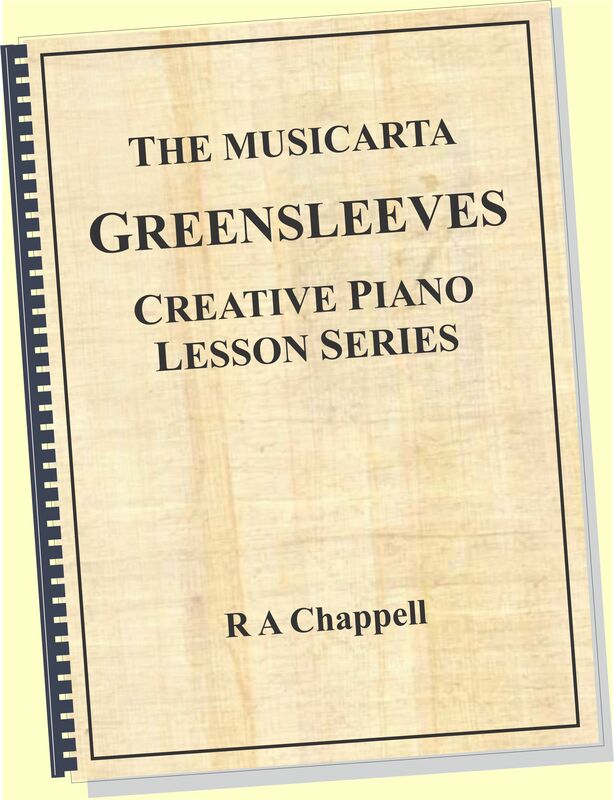 Young pupils will take to the following exercises quite naturally, and adult continuers will soon see where they have been held back in their playing by omitting this important facet of training. Hand patterning in modern keyboard playing often mimics the two-handed action of the bongo drummer, and all modern keyboardists should aim to become expert ‘desktop drummers’. 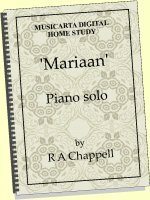 Many Musicarta lessons recommend learning the complicated rhythms found in modern music in isolation, away from the keyboard and stripped of the actual notes, and you can soon verify that this quickly pays dividends. The tapping exercises given here offer a systematic way of developing the ability to do this. 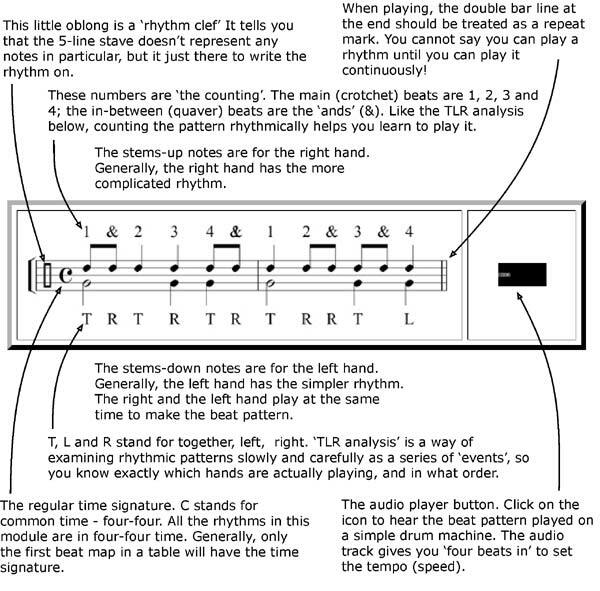 The rhythms you will be working with in this module are written down in ‘beat maps’. Here is a diagram that explains what the beat maps show. 1. Click on the speaker icon to hear the audio file. Read the beat map as you listen to the audio file until you are sure you see how the beat is written. 2. Tap along to the audio track while reading the beat map, then tap to the beat map alone when the audio track stops. NOTE: The double bar line at the end of an example should be treated as a repeat mark. Patterns are not learned until they can be played continuously! 3. Tap a (new) rhythm from the beat map alone, then play the audio file (by clicking on the speaker icon) to see if you are right. 4. Count the rhythm out loud to the audio track. You may find counting out loud awkward at first, but it definitely speeds up your progress, so don’t skip it! 5. 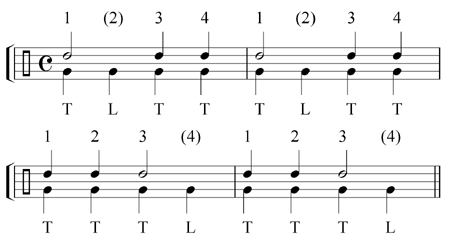 ‘Tap’ the rhythm at the keyboard – that is, play notes for the taps. Keep it simple, and see if you can create riffs of your own. 6. Tap your foot a steady four if you can while you do all this, if you can. If you can’t, work at it! 7. 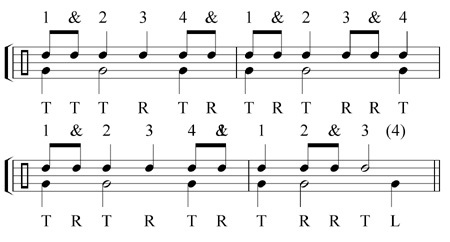 Get into the habit of writing down your own one- and two-bar rhythm patterns. 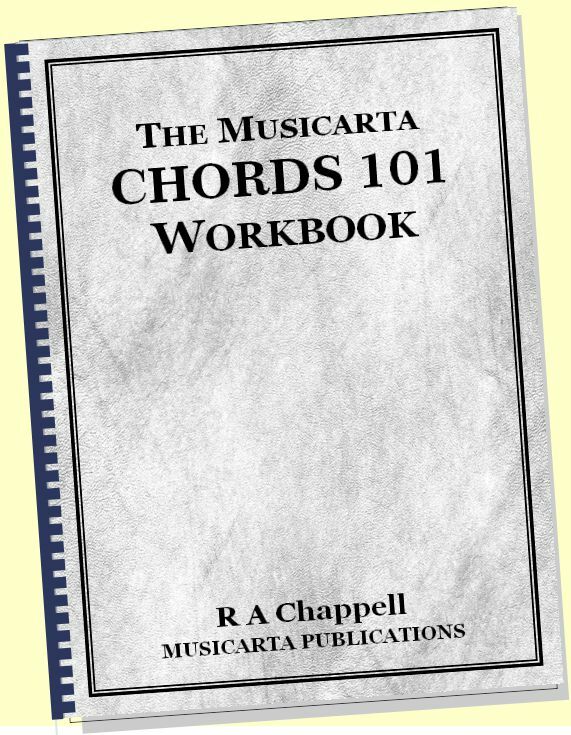 If you want to write down tunes you like or your own compositions, working out and writing down the rhythm and the note values is half the work. You don’t need special paper – ordinary lined paper will do. placed. 8. For a challenge, ‘reverse’ the patterns. 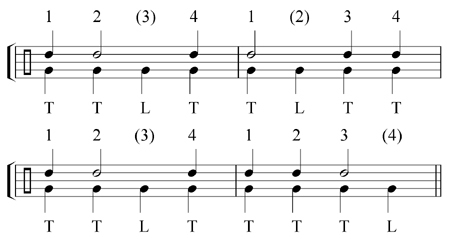 Play the top rhythm with the left hand and the steady four bottom line with the right hand. The left hand often needs more practice in this line of work. 9 Work hard at not ignoring the counting and TLR (together-left-right) text above and below the beat maps – a great danger when there are music notes to read! It is well proven that viewing rhythmic patterns from counting and TLR perspectives speeds the build-up of rhythmic and syncopation skills. 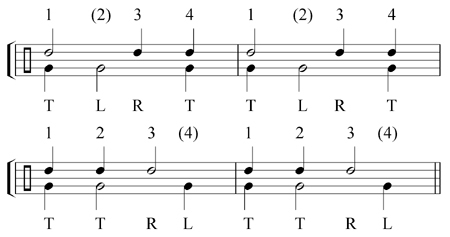 The tables are arranged overall in order of difficulty, but the Missing Quaver and Dotted Crotchet series can be treated as stand-alone units. Link through to individual tables here. Click on the audio player in the right hand column to hear the pattern in the beat map. If you are unsure what to do, click up to the <a href="#'Ways to use this material'">'Ways to use this material'</a> section here. 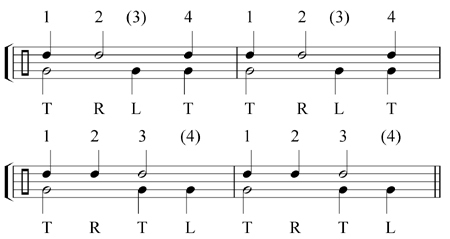 At this stage, depending on ability and needs, you could vary the preceding patterns with the following new left hand rhythms. 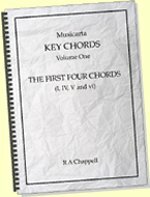 Alternatively, just proceed with the series and save these variations for variety at any later time with any of the right hand patterns. Here are some patterns which combine right hands from the ‘Two quavers in a bar’ group with the alternative left hands. The patterns are ‘realised’ – they have notes put to them in little studies. Make sure you can see how the rhythm of the beat map is ‘in’ the study. 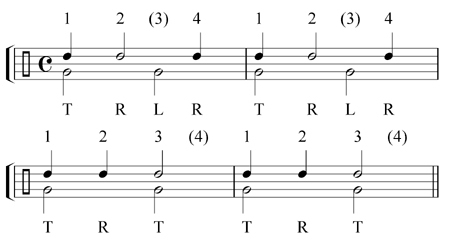 The first study covers the first two rhythms put together. The study has a little ending tacked on, whcih you should try to get 'by ear'. 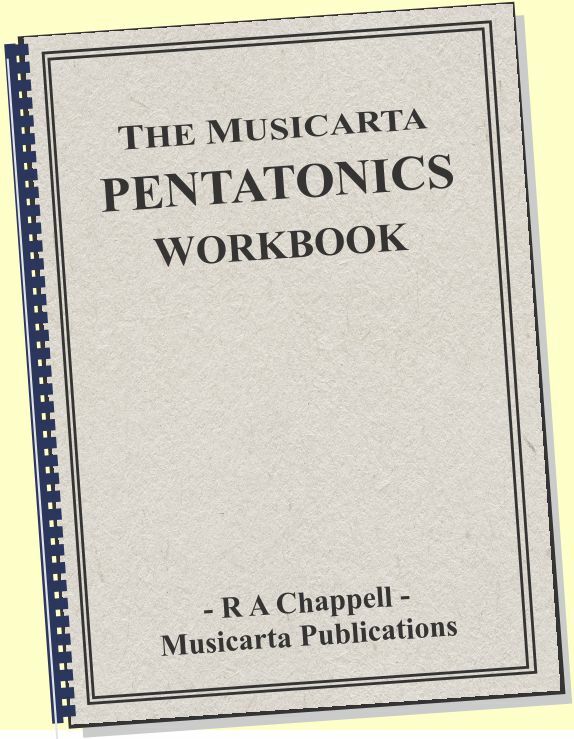 These little studies are very like pieces from the graded piano tutors you buy. 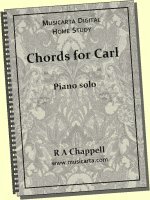 Teachers and pupils alike can see how valuable practicing the rhythmic pattern of a piece on its own is, and will hopefully include this technique as a routine element of their conventional piano practising. 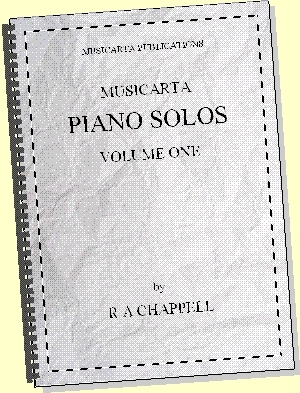 This is the end of Page One of the Musicarta Tapping Exercises series. <a href="http://www.musicarta.com/beat-and-rhythm_5.html" target="_blank">Part Two</a> carries straight on with slightly little more complicated patterns, so make sure you can tap the beat patterns in this module reliably before going on. Make a habit of listening for the rhythmic patterns in your favourite popular music, and try to tap out the beat. You don't need any special equipment, and you can be getting better at playing all the time, as your improved rhythmic skills filter through into your playing. Tap on!